At first, your puppy follows you like a shadow; after all, it is important to follow one’s reference person. For the dog, this guarantees shelter and protection, social contact, safety and food. So why should you put your puppy on a lead at all during your short walks? Because this way, you have him under control – after all, you always take your small child’s hand when the situation is unpredictable. You are simply making your puppy safe with the long line. It means that you will never be in the awkward position of having to run after your four-legged friend because there’s danger ahead, for example. Your little bundle of fur needs to learn to come to you in dangerous situations and when he’s afraid, instead of fleeing somewhere in a panic. Imagine that there’s a bang and your dog runs out of his wits towards a main road. Not a nice picture. The additional benefit of the long line with a puppy is that you won’t need to get him used to it later on. Not all dogs need to be put on the long line at five to six months old, but when they are older the long line is used very frequently. The box on page 47 explains why this is the case. At any rate you should make the effort – because what you teach your puppy now will only need to be consolidated and engrained later. Unlearning unpleasant behaviours which have already crept in over months or even years means that even more intensive work is called for – which is why you must not let your puppy make mistakes! Puppies do not need very long walks at first. Four to five times daily of 10 to 15 minutes is totally sufficient for dogs up to about six months old. Keep in mind that joints and bones are still very soft and pliable. For one thing, you can always combine a small unit of the orientation training with a short walk. For another, you’re allowing your puppy to discover the world in a relaxed way. If your puppy has discovered something fantastic, go to him and join him in taking a look at what’s there. Discovering the world together encourages bonding. If your puppy has something in his mouth that doesn’t meet your approval, do a swap. Show him a delicious morsel of food or get out his favourite toy. If he drops what he’s got in his mouth in return, say ‘Drop’ as he’s doing so and give him the morsel of food / toy straight away. Pay attention that he doesn’t pick up what he’s spat out again – place one of your feet on it. Pay attention that you don’t throw the exchanged item away – this will draw your dog’s attention to it again! If you are holding it, raise it slowly, put it in your pocket for now and dispose of it discreetly later. Then ask him to run with you with a jolly ‘Come on!’. 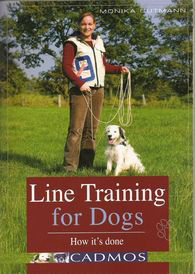 As your dog is on the long line, you have a great opportunity to practise this. Your dog cannot run off ahead of you and turn it into a merry chase. Rather, you are able to act calmly and make him a better offer. Your puppy learns to trust you this way because your attitude is confident and poised. Once your puppy has made the association that he does not need to keep his ‘treasures’ safely away from you, he will start bringing you things. Be glad about this! Your puppy trusts you and you can always decide whether he is allowed to keep something or is going to get something less risky in exchange. Read the section ‘Building up recall’ to find out what you need to practise on walks.